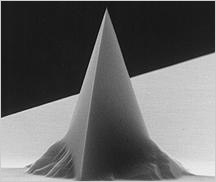 NanoWorld Pointprobe® CONTSC AFM probe is an alternative cantilever type for contact mode applications. The length of cantilever is reduced with respect to the preferred contact mode type enabling easier exchange with non-contact mode probes for some AFM instruments. Additionally, this probe type allows the application for lateral or friction force mode. Additionally, this probes offers typical tip radius of curvature of less than 8 nm.